If you’ve been following my posts, you know by now that Andrew is crazy about memory match games. 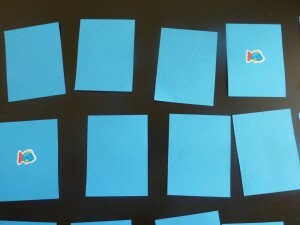 Using colored index cards and stickers makes it so easy to create new, thematic memory match games that go with whatever we are doing. 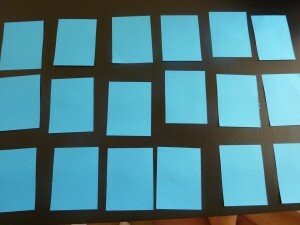 (Here is the link for the original Thematic Memory Match post with step by step instructions.) 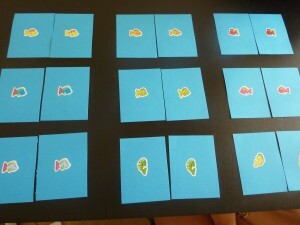 Since it is summer and we are still in our “beach” theme, I made a game with lots of different colored fish. Through this basic game, we work on social skills and game playing rules by taking turns (which isn’t always easy when one of us knows where the matcher is! 🙂 ). It also allows me to work on visual discrimination skills and descriptive vocabulary while noticing out loud how each pair is unique. 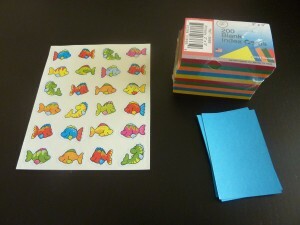 Colored and unruled index cards + thematic stickers = Fun and easy memory match game! Stickers on in the middle of the card. Matching pairs ready to mix and play. Memory match game set up. Matching pair of fish found! 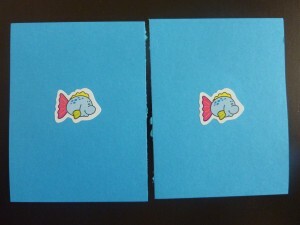 This activity can be modified to incorporate some movement by creating a “Crawl and Match” or “Run and Match” station where the child picks up a card and has to go down and match it with its partner.